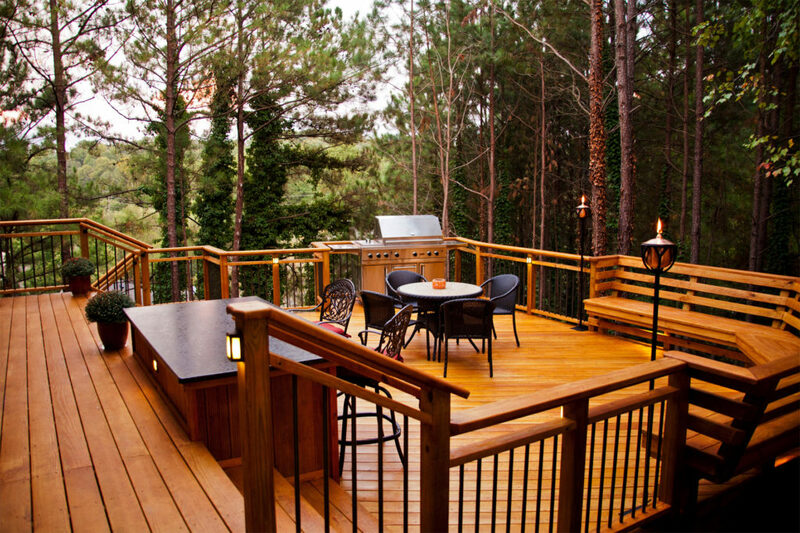 Few home improvements can match a wood deck for usefulness, beauty, and enhanced value to a home. For adults, decks offer outdoor living space for entertaining, relaxing, and dining. For children, they provide a secure outdoor play area. Decks are considered an essential and cost-effective way to add living space to your home — it’s a remodeling project that you can enjoy now and reap the benefits of the resale value a deck brings to your home. Whether you are building the deck yourself or hiring a contractor, the use of pressure-treated wood helps assure that your project will provide years of enjoyment and peace of mind. Some pressure treated wood products provide warranted protection against termites and fungal decay. To view the original PDF – Click here. contact/freshwater, and heavy duty applications. 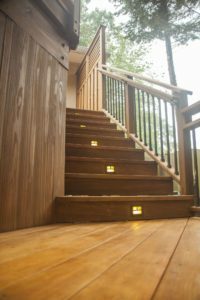 When planning your deck, consider the safety of your family and guests. A deck is an uncovered, outdoor structural floor system that is expected to endure changing weather and carry significant loads over many years. Careful material selection, design, installation, plus periodic inspection and maintenance are keys to long-term performance and structural stability. Once you have decided on the basic size, shape, and location of your deck, check local building codes to find out if there are restrictions as to height and size within your subdivision or community. 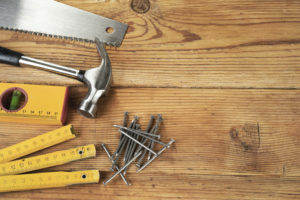 Contact your local building department for any specific requirements and guidelines they may have, and find out if a building permit is required before you build your deck. Note: if you are located in Western states and are planning to build a deck in a designated wildfire area, you will need to consult the Wildland Urban Interface Code for building requirements. More and more newly constructed decks are built by do-it-yourselfers as expansion of their living space. Homeowners take pride in their accomplishments as they enjoy a space they have created. A basic, low-level deck is a home improvement project that can be done by a capable do-it-yourselfer. It doesn’t require posts, stairs or railings. Design is straightforward. No advanced carpentry skills are required. If you have all of the tools you need, you’ll probably save around half the cost by building yourself. Budget several weekends to complete the job, plus a week for concrete to cure. Spend time up-front familiarizing yourself with deck construction from reputable sources and at your local home improvement store. If you want a more complex deck or you’ve never been involved in building a deck before, it is advised to hire a professional. Construction must be sound in order for the deck to last. Plus there are building codes that must be followed for the safety of your guests and any future occupants of your home. videos. You will save time (and money) in the long run. Over the past few years, many alternative materials have been introduced for deck construction. The primary deck material, however, is pressure-treated wood. We recommend Wolmanized® Outdoor® Wood, a trusted brand that’s tough enough to stand up to termites and fungal decay, and versatile enough to be used in all types of natural environments. It combines the natural beauty of real wood with the most popular, widely accepted preservative and a limited warranty against termites and fungal decay. There are other additional features available, including kiln-dried wood and treated wood with water repellent. These improve performance and may decrease maintenance requirements. Once you draw up your basic plan, take it to a home center or hardware store, and they can estimate a number of materials you will need. Be sure to check the labels to get the wood that is properly treated for your intended use. If the material you need is not available, check with the professional desk about special ordering. When you or your contractor purchase pressure treated wood, be sure to check the end tag stapled of the end of the wood. Each piece is identified for a specific use. This information will help you decide the correct material to buy for each part of your outdoor project. IMPORTANT: Wood is treated with different amounts of preservative for specific applications. The label will designate Above Ground, Ground Contact or Ground Contact Heavy Duty classifications. However, there are some cases where wood used above the ground should be treated to Ground Contact. Remember, if your project comes in contact with the ground or fresh water or is built in a manner that does not allow the wood to easily dry, Ground Contact treated wood must be used. The American Wood Protection Association (AWPA) requires pressure treated wood used in many physically above-ground applications be treated to Ground Contact requirements. Note: treated wood will last a long time, therefore so will your workmanship. You’ll be happier — and your project will look better — if you take your time and observe the following construction techniques. Check your local building code requirements and get a permit if required. For additional industry guidance, see www.awc.org/publications/download.php. Separate deck boards to allow for expansion and contraction. If heavy and wet, separate boards no more than 1/16” as some shrinkage will occur. If light and dry, separate boards about 1/8” to allow for swelling. Shorter spans between joists will help to minimize warping and twisting of deck boards as they dry. Avoid designs with long cantilevers unsecured at one end; check with your local building department on maximum cantilever permitted. Place boards bark side up to help shed water. They will also be more likely to have treated sapwood on the exposed face. Make sure there is good under-deck ventilation for above-ground treated wood, allowing airflow around the entire deck. All material treated for above-ground use must be off the ground where it can dry easily and be free of leaves or other debris. If not, use wood treated to Ground Contact. All joists and beams must be treated to at least Ground Contact. If a board is bowed, install it with the crown up. Gravity and the weight of people and furniture will flatten it. Or, if a board has a slight bend to it, it sometimes can be straightened as it is screwed or nailed in place. Use 3 1/2” long nails on nominal two-inch decking and 3” nails for 5/4” decking. Use two nails across a 2 x 4 and three across a 2 x 6. Drive nails at a slight angle toward each other. 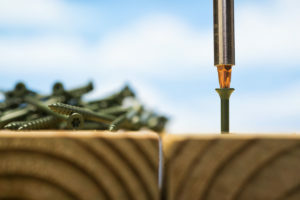 To reduce splitting when using nails, especially near the ends of boards, drill a pilot hole about three quarters the diameter of the nail. For dense or brittle wood, grind sharpness from nails or blunt the points by striking them carefully with a hammer. Orient supporting posts so that original factory treated ends are in contact with the ground. Trim the top ends as needed and cover them with post caps or cut them at angles to shed water and treat with a brush-on preservative (see above). No maintenance is needed to maintain resistance to decay fungi and termites. However, protection is required to maintain the wood’s appearance against weather. Sun and rain cycles cause stresses in lumber and result in swelling, shrinking, warping, and cracking. 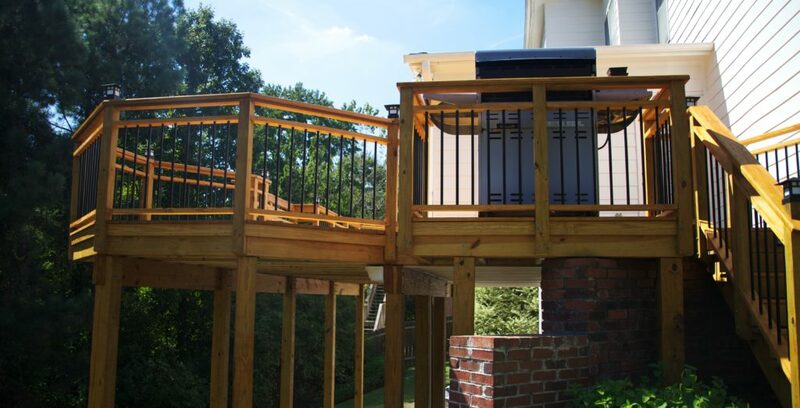 The North American Deck and Railing Association (NADRA) recommends yearly deck safety checks. For a checklist, see www.nadra.org. To help protect against moisture damage, apply water repellent after your project is completed and the wood has had a chance to thoroughly dry. You can use a deck cleaner/brightener every couple of years to freshen the look of your deck. Bleach is not recommended since it contains chlorides and can cause hardware corrosion. After cleaning the deck, reapply a water repellent or water repellent stain to restore color to the deck. Hot-dipped galvanized fasteners (meeting ASTM A 153) and connectors (ASTM A 653 Class G185 sheet), or better, are recommended. Fasteners not meeting or exceeding these requirements could result in premature failures and degradation of fasteners and treated wood. Aluminum flashing (3015 or similar alloy) may be used in contact with micronized copper azole treated wood in interior or exterior, above ground applications that are damp or intermittently wet. For dissolved copper azole preservative treated wood or whenever treated wood is subject to immersion or frequent or prolonged wetting, factory coated aluminum or an insulating moisture-resistant barrier should be used between the treated wood and the aluminum. See the end tag for type of treatment (CA-C indicates dissolved copper azole and MCA-C indicates micronized copper azole). Moisture, salt, and other agents can cause metal corrosion, but metal-free treated lumber is no more corrosive than untreated wood. Check with your hardware manufacturer regarding specific uses. For those projects needing building code compliance, you can use hardware with the minimum protection permitted by codes and local regulations. Aluminum can also be used in direct contact with this wood. The following precautions should be taken both when handling the preserved wood and in determining where to use and dispose of it. Many of these precautions also apply to untreated wood and other building materials. All sawdust and debris should be cleaned up and disposed of after construction. Treated wood should not be used where it may come into direct or indirect contact with drinking water, except for uses involving incidental contact such as support posts for docks or bridges. Dispose of treated wood by ordinary trash collection. TREATED WOOD SHOULD NOT BE BURNED in open fires or in stoves, fireplaces, or residential boilers because toxic substances may be produced as part of the smoke and ashes. Treated wood from commercial or industrial use (e.g., construction sites) may be disposed of by complying with local landfill rules or burned in commercial or industrial incinerators or boilers when done in accordance with state and federal regulations. After working with wood, and before eating, drinking, toileting, and use of tobacco products, wash exposed areas thoroughly. Pressure treated wood can be stained or painted and it should be coated with a water repellent to help maintain appearance. With any coating, always follow the manufacturer’s directions on the product label. How long must you wait before the wood is dry internally depends on the climate and the wood’s exposure. In summer in the American Southwest, deck lumber open to sunshine can dry in a few days. In cool, damp weather or when shaded by an overhanging roof or tree, it will take much longer for wood to dry. On average, we recommend waiting six months before applying paint or solid color stains and three months before applying semi-transparent stains. Too dry is always better than too wet! When wood is pressure-treated, it is saturated with a liquid solution of preservative diluted in water. In a typical situation, the wood you buy is still very wet. is suggested for best results. Semi-Transparent Stains — Semi-transparent stains do not block moisture movement like paint and solid color stains, so they can be used after the wood has dried long enough to ensure that they will be absorbed evenly into the surface. Be sure to test an inconspicuous area to make sure that application does not result in uneven color or blotchiness. Water Repellents — Most water repellents can be applied immediately. Be sure to follow the manufacturer’s instructions. To help protect against moisture damage, some pressure treated wood has built-in water repellent. The water repellent helps minimize the tendency of wood to warp and crack while providing improved dimensional stability. Paints and Stains — If the wood is dry, oil-based paints and stains may be applied immediately. To apply a water-based coating, wait for the surface of the wood to weather to allow even penetration and adherence to wood. Hint: If water beads on the surface, it is too soon to apply a water-based coating. Always test the coating on the most shaded part of the deck to make sure it absorbs evenly without blotching. Water Repellents — It is recommended to apply a water repellent or combination water repellent and stain coating every year or two thereafter initial installation, depending on the product used. Always follow the manufacturer’s instructions. In some areas, you can buy treated wood that is Kiln Dried After Treatment (KDAT) or Air Dried After Treatment (ADAT). In these processes, moisture is removed from the wood before shipment to a lumber dealer. KDAT or ADAT will be marked on each piece of wood on either the end tag or an ink stamp. Paint, Stain, Water Repellent — The moisture content of the wood is already in balance with atmospheric moisture levels, so coating can proceed immediately unless wood has built-in water repellent.